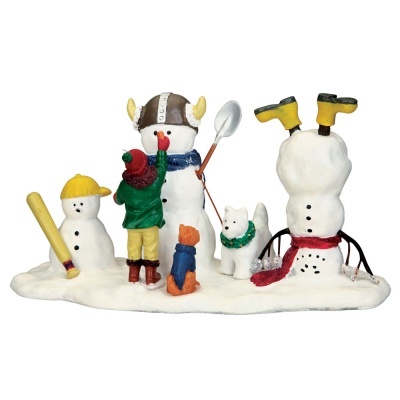 Lemax New Friends To Play With Table Accent depicts a boy and his dog with a vivid imagination putting the finishing touches to a friendly group of Snowman characters in his own back yard! Lemax New Friends To Play With is suitably placed in and amongst a seasonal Lemax village miniature Winter scene. A favourite Lemax Village themed collectable piece which joined the Lemax Carnival collection in 2015. New Friends To Play With offers a delightful individual hand painted polyresin scene including multi figurines on a snowed base to compliment your seasonal Lemax Christmas Village.